AKIPRESS.COM - It was a case of hold the honey, double the mustard in Times Square at lunchtime on Tuesday, Telegraph reports. 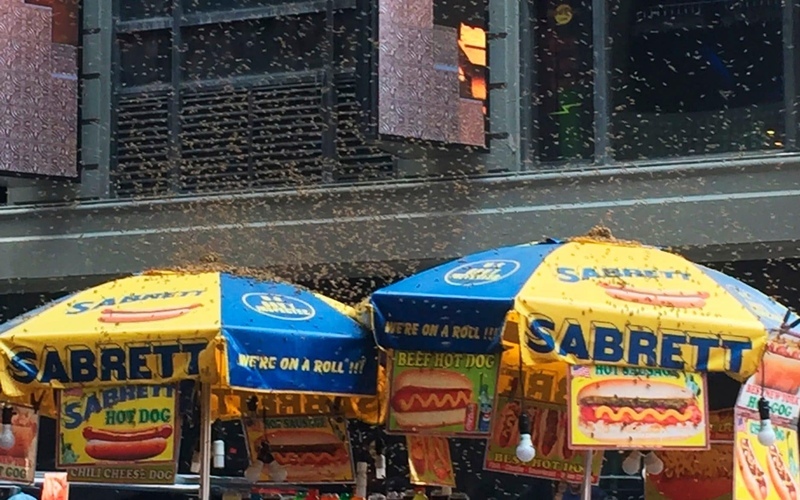 Police shut part of 43rd Street near Seventh Avenue after a thick swarm of bees gathered atop a blue and yellow umbrella over a hotdog cart in an area of Manhattan already buzzing with pedestrians, tourists and traffic. A police officer who keeps bees himself, arrived at the scene in Times Square at 2:30 p.m. (EST), wearing a mesh-hooded beekeeper suit. He deployed a vacuum cleaner-like device to collect the bees unharmed, said New York Police Detective Sophia Mason. The officer had the majority of the bees collected in a matter of minutes.